We're wanting to go to Croatia for our honeymoon. It's somewhere we have both been as kids - before the nasty old war that tore the place up - and bothfancy going back to. We fancy going all inclusive too, so that we don't have to worry too much about taking huge amounts of spending money with us and so on... plus it's something I've always wanted to do. It's so idulgent! So... we looked at Hotel Epidaurus and Osmine and they both looked great! There's also a few on here we liked the look of. But think this is the one!!! There's SO much on offer! Hosting the most famous beach in Croatia, the stunning White Horn, Bol is a well known mediaeval seaport with an abundance of cultural sights and peculiar places for you to explore. Plenty of cafes, bars and restaurants line the busy harbour promenade and guest can rely on the mini-train to travel to and from the hotels. 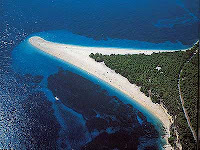 Location: Situated on the southern shores of the island of Brac under the steep heights of Mt. Vidova Gora. The Bonaca comprises of eight pavilions built around a central reception building, set amongst beautiful pine trees just a short walk from the centre of Bol and about 150 metres from the beach. There is a large swimming pool and a separate children’s pool with water slides. Ideal for families with children and groups of friends. Please note that facilities not listed in the All Inclusive description may be subject to a local charge. ACCOMMODATION: Prices are per person, in a twin room with bath, WC, balcony, air-conditioning, safe (local charge), TV and telephone. Family room for 2 adults and 2 children up to 14 years are available. A little bit worried about the amount of time it takes to get to the hotel, but if we take some extra batteries for the DS's and a good book or two each we'll be fine... and maybe a packed lunch and dinner. I will have to speak to the holiday punters and make sure that bit of travel is included... coz you never know!! Hidden costs and all that!